Just as it has dominated headlines for the past year, the migration crisis was high on the agenda in Davos last month. As chair of the Forum's Global Agenda Council on Migration, here are some of my observations on what was discussed. Europe's refugee crisis was on everybody's minds in Davos: it was discussed on formal panels, at informal events, in public fora and through an experiential exhibit. 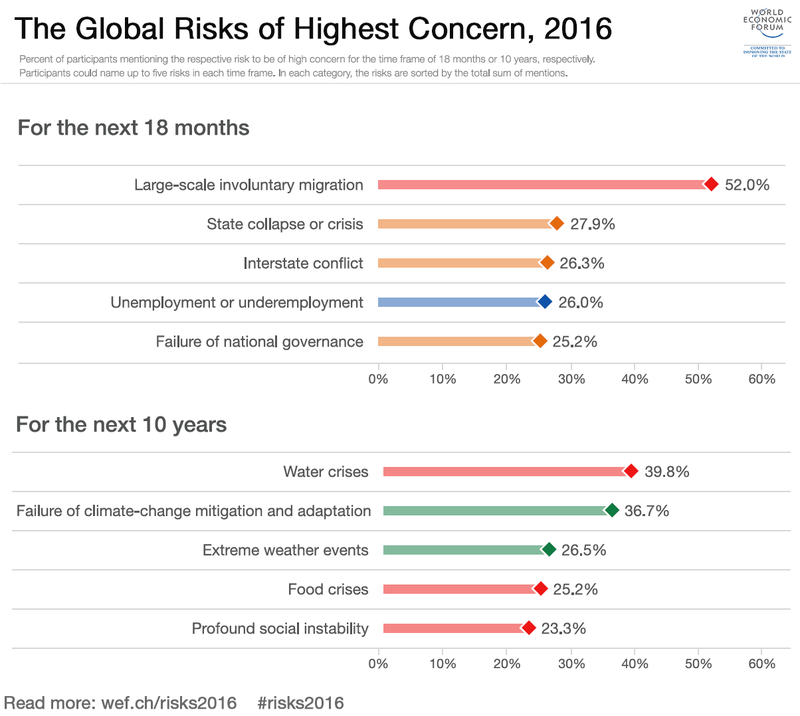 While large-scale involuntary migration topped the list of worries in this year's Global Risks Report, this still shouldn’t be taken for granted. The Annual Meeting took place against the backdrop of many other crises that could have monopolized discussions, and many of the participants were from outside Europe. But while it might have been expected that European government and civil society representatives were keen to discuss migration, so too was the private sector. We on the Global Agenda Council on Migration have worked hard to get the private sector involved in tackling the refugee crisis, but it sometimes seemed as if the topic was too toxic to get many takers. At Davos, though, I sat alongside corporate executives in a panel on the role businesses could play in overcoming the challenge. More importantly, all these discussions were solution-oriented. One question that kept coming up was whether IT could be the answer. How can IT empower Syrians to end the crisis? Might IT provide a way to employ Syrian refugees in their region, for example as interpreters or translators, allowing them to make a living without risking the often dangerous trip to Europe? How can IT disrupt smuggling and trafficking businesses? Can IT help organize support for Syrian refugees in Europe, for example by allowing online donations? Almost inevitably, the topic of migration at Davos this year quickly became synonymous with Syrian refugees. I moderated a session that within the first minute turned into a debate about the UN’s response to the Syrian crisis and refugees. What was sometimes lost in the discussions was the obvious fact that Syrians are not the only refugees in the world and Europe isn’t the only place affected by refugees. There are plenty of other migration issues that should have been explored – from how to match the global supply of and demand for labour to how to manage the global competition for talent. What's more, the discussion on refugees in Europe was also almost always cast as a crisis and humanitarian challenge. But as I have in the past argued, if properly managed, refugees in Europe may become an opportunity: to fill demographic deficits, plug labour market gaps, and create new talent. For there to be an open and frank debate on such an important issue, you need to make sure everyone is represented in the discussions. The lack of any authentic migrant voice was regrettable, and the result was that many of the points made about the refugee crisis and refugees themselves ran the risk of sounding patronizing. I did, however, see several people leave the excellent ‘A Day in the Life of a Refugee’ exhibit in tears. For a constructive debate, you also need to make sure all opinions are heard, even those that make us feel uncomfortable. Most participants in Davos recognized that refugees are in need of assistance, and a few saw them as potential employees. But nobody was willing to speak openly about the challenge we face in integrating these refugees. Dissenting voices were slapped down, and politicians who were openly hostile to refugees in their country were cowed into silence at Davos. I don’t blame the Forum, which always promotes objective debate, but this reaction does reflect a general desire to be seen and heard to do the right thing. While this is a normal human reaction, it will do little to generate solutions. Overall, I cannot believe that anyone, even the most disinterested, left Davos without having reflected on migration and the refugee crisis. They may not be perfectly informed, they may not be aware of the full range of perspectives, and they may not realize the full spectrum of migration. But their biases and beliefs – and perhaps behaviour – have all been changed. What more could we have hoped for?